Lance Price is an author, political commentator, former BBC correspondent and media advisor in 10 Downing Street. An Oxford alumni, Price has worked for BBC for nearly 2 decades, and is an avid traveller. He has worked in North Ireland, was a national radio and TV reporter, Defence Correspondent, and finally a Political Correspondent at Westminster. In 2011, Price left journalism to join the press office at 10 Downing Street as a special adviser for Alastair Campbell. In 2000, he became the Labour Party’s Director of Communications and helped plan -and then run the 2001 General Election campaign. Since 2001, Price has been a freelance writer, broadcaster and commentator. He also lectures in politics, journalism, and at times does media training as well. He has authored three book so far: The Spin Doctor's Diary, Time and Fate, and Where Power Lies. 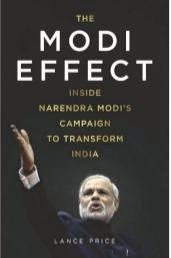 Que: Your book The Modi Effect: Inside Narendra Modi's Campaign to Transform India claims to give a never seen before view of Modi's Lok Sabha election campaign from the back-room. Can you say that you have covered every aspect of the campaign? 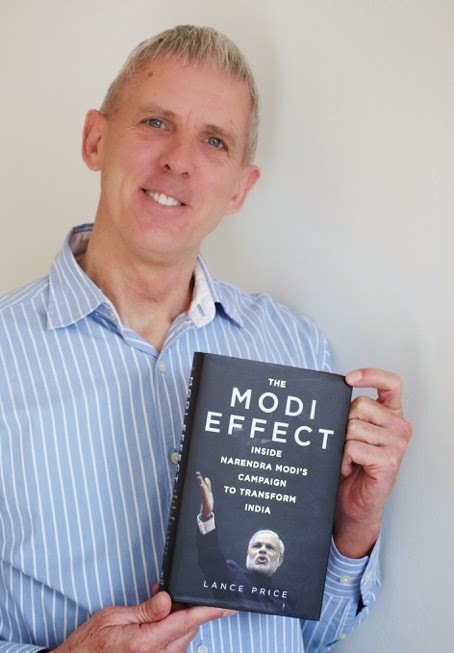 Lance Price: I was very fortunate to be able to interview Prime Minister Narendra Modi four times and get a great many new thoughts from him about how me managed the campaign and the tactics he used. I also spoke to people at every level of the campaign, from high-level advertising executives to junior foot soldiers who worked at the booth level. I have done my best to cover all aspects of the campaign. Some of it was very modern and high-tech, including the 3D hologram rallies. And The Modi Effect tells the story of what a huge undertaking these were and how sometimes it appeared that it might all go wrong, but by hard work and good fortune it worked! I hope there is plenty of detail for readers who would love to know more about exactly how the election was planned and executed. But it is not just for politics addicts. I have tried to make the book interesting for all readers who would like to re-live some of the great moments of the election and find out how it looked from the inside. Que: Being an outsider, what inspired you to take up PM Narendra Modi's election campaign as the subject of your book? Do you think you have done justice to the Indian point-of-view? Lance Price: It is true that I am an outsider but I hope that gives me a unique perspective. I love elections and have seen many in different parts of the world, although nothing to compare with the Modi campaign. I wanted to see how he did it but also to see what lessons people in the west could learn from an Indian election. There will be a campaign in my country, the UK, very soon and in America next year. I think that the Modi campaign was a trend-setter and that many people outside India will be fascinated by the story also. Of course all the people who gave their time to be interviewed were Indian and the book is full of their stories, so I very much hope it does do justice to the campaign through Indian eyes. Que: Tell us about the research you did for the book. How and where did you begin, what made you decide that you had enough material for the book? Lance Price: When you are researching something like this, there is no such thing as enough material. I would have been happy to meet more and more and people and hear their stories, because they are all so fascinating. But at some point you have to say that you now have enough to tell the story properly and fairly. And because it is about last year’s election we wanted to make sure the book was available quite quickly while the memories of the election are still so fresh in everybody’s minds. I began with Mr Modi himself, of course, and he had many suggestions for how to tell the story of the triumph of Indian democracy. And I also spoke to academic experts and journalists in India to get a rounded perspective. Que: Share something interesting that happened during your research. Lance Price: The minister Mr. Piyush Goyal was very kind to invite me to his house and offer me dinner with his wife. They were both so excited by the campaign and full of good information. At one point during the meal Mr. Goyal told me about a TV advert he had planned to show after Mr. Modi was denied permission for a rally in Varanasi. The first version would have been very controversial because Mr Goyal and his team were quite angry when they made it. In the end they decided to use a more upbeat advert and so nobody had seen the original. But Mr. Goyal still had it on his phone so he pulled out his mobile and shared it with me. You can read all about it and what I thought of it in the book. Que: How do you think Modi's victory in the elections has affected the world? Lance Price: Narendra Modi’s election has already had a huge impact. He has already travelled to many world capitals and taken him with him the message that India is changing. His victory has gripped the attention of people all over the globe which is another reason I wrote The Modi Effect. I think if people want to understand the new direction India is taking then first they have to try to understand Mr Modi. And he is a complex and fascinating person. India’s size and economic potential means that whatever happens in India will have a big impact internationally. Que: Do you think Modi's victory is a reflection of the shift in people's mindset with regards to the minorities? Lance Price: One of the most interesting things about the Narendra Modi campaign is that it challenged the mind-set of people about all sorts of things, not just the minorities. He said to all Indians that it was time to rethink how politics is done in your country. I call it in the book ‘recasting India’ with a deliberate pun on caste and how people decided to cast their votes. We will have to see how permanent those changes are. Mr Modi preferred not to address his campaign at the minorities but to talk about all Indians and the needs they all have, whether it is jobs or a roof over their heads or a government that is less corrupt. What I found very significant was the stress he placed on women and young people in the election. And he has repeated those priorities since he became prime minister. Que: Do you think that Modi's campaign and the subsequent victory was a hype created by the Indian media? Lance Price: No, the election campaign and Modi's victory were very real, not hyped. There was definitely lots of excitement in the media and one of Modi’s successes was to get the media very worked up about him and what he was saying. He managed to dominate the media in many quite clever ways and my book explains how this was done. If Congress and the other parties think they were out-shone in the media then they should study what the BJP did and look again at their own strategies. Que: You are the only author who has secured interviews with Modi and his core team. How was the experience? Lance Price: I was very fortunate to be the only author to be granted access to Narendra Modi and several of his ministers and key campaign workers. It was a great privilege and I am very grateful to him for his time and to everybody else also. He is a very busy man but he was always very courteous with me and did not appear to be in any hurry at all. So we were able to discuss many things at some length. It was also important that he said I could write the story in my words without any strings attached in return for the access. Being with him in the room for over an hour at a time was fascinating. He is very engaged in the conversation and he loves to talk about the details of the campaign and how it felt for him. His stamina and energy are like those of a much younger man!